After four days at our Extended Field Trip #001 in Peterborough at Artspace, we installed our work and presented our research findings in the main space at the gallery. After nearly 96 hours in the city, we came to realize that everything is ok in Peterborough. Undoubtedly, we realized this by comparing our experiences in Windsor. Small things such as the fact that the parking meters in Peterborough accept change all the way down to nickels, or larger things such as the incredible number of people who either plan to stay in Peterborough or at least plan to come back eventually, make the city of Peterborough ok. Though these four days have been only the very first opportunity we’ve had to spend a concentrated amount of time in another city in order to try to engage in some level of research, we felt like we learned a lot. There’s something about the entrepreneurial spirit in Peterborough, at all levels, that has seemed to encourage the right people to stay in the city, and it’s this sense at the very base of everything that we experienced that we need to begin to translate back to Windsor. This translation, at the very least, will turn into more dialogue with more people back in Windsor. There’s so much to be done here and yet it seems like if more people can be convinced to try to stick it out here, just a little bit longer, that maybe we will be ok too, eventually. Day 3 of our Extended Field Trip #001 in Peterborough at Artspace was filled with design, math, and construction. Having decided that the general sense of the city is that “everything is OK,” we moved forward on printing posters and building some text that will be on display for the opening Friday night. We had many adventures in carpentry today and I think this is just the beginning of working on some more projects of this scale. Designing first thing in the morning—potential posters for our recommended motto for the city of Peterborough as part of our Extended Field Trip #001. We spent the better part of Day 2 of our Extended Field Trip #001 in Peterborough at the wonderful Artspace talking to some new people, synthesizing some questions from our broad understanding of the city so far, and trying to get a sense of what if anything there is to change about this place. We also explored some more of the downtown core on foot and discovered some really specific things about the city that are starting to add up and answer our questions about how it is that things seem okay here. Mapping Peterborough, its residents’ feelings about it, and then comparing those maps of sorts to Windsor is revealing in helping us to understand the very specific view so many Windsorites have of our city. I’m not sure that we’ve been able to articulate this yet, maybe tomorrow when it’s not so late. As part of our Extended Field Trip #001, we’re in Peterborough staying at the artist-run-centre, Artspace. We’re hoping to conduct some intercity research where we’ll attempt to understand the similarities and differences between Peterborough and Windsor and hopefully find some intersection thereof to which we can respond. We arrived in Peterborough in the late afternoon and did some exploring immediately. We’ll be posting more of our general observations and assumptions about why we saw what we saw later, but for now, we thought we’d give a visual introduction to this city. 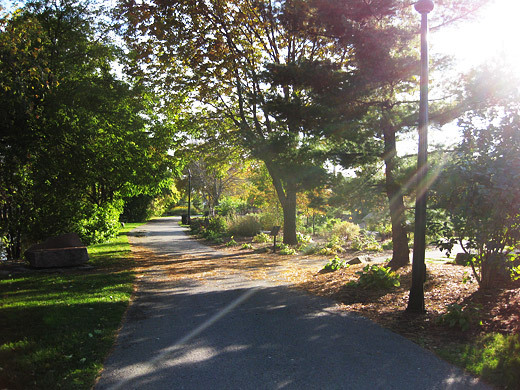 Above, a path that follows the Otonabee River, which sits tucked away beyond the visual border of the downtown core. Somehow, this describes the general sense of Peterborough—nice, strangely well-maintained, and a place that just seems to work. The city is considerably different than Windsor, and we’re hoping to figure out why it is that this city of 75,000 north of Toronto is a place that few people want to leave. Basically, this post will present most of what we saw, much of which we’re still trying to reflect on and figure out. The discussion we had last night with some of the Artspace folks helped to frame and confirm what we saw—this place is okay and stable. Broken City Lab is heading up to Peterborough, Ontario for all of next week (October 12 – 17, 2009) for an extended field trip to collaborate with Artspace for a series of community and inter-city research initiatives, workshops, and interventions to understand the city of Peterborough, its infrastructures, and its communities. If you’re in Peterborough or the area, here’s the address for Artspace: 3/378 Aylmer St. N. Peterborough, Ontario.